WorldCat Discovery is an easy-to-use interface that searches across all types of library content--books, journals, articles, films--in a single search. 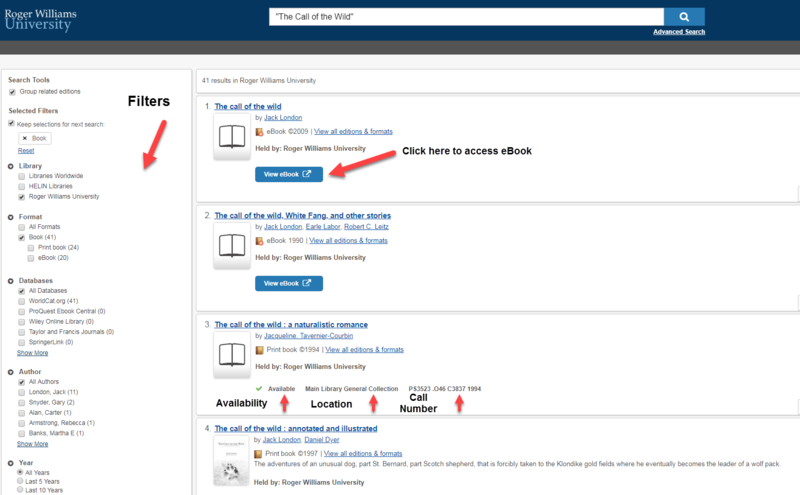 The basic search screen is located on the library's home page. Click on the Books tab at the top of the search box, enter a specific title, author, or keyword into the single search box, and click search. If you know the specific title of the item you are searching for, enclose the title in quotation marks. This will result in a more targeted search result. The results list gives a brief description, availability, location, and call number for each item. Use the filters on the left to refine results by Library, Content, Format, Databases, Author, Year, Language, or Topic. Accessing eBooks couldn't be easier--just click on the View eBook button. If you are prompted to login, use your RWU single sign-on credentials. If the book you are looking for is listed as Held by: Roger Williams University and it's status is Available, you can go to the shelves to retrieve it. Books are shelved within the library by call number. If RWU doesn't own a book you are looking for, or if the book you are looking for is already checked out, you can borrow it through HELIN or Interlibrary loan free of charge. For more information on HELIN loans and Interlibrary Loan, see the second page of this LibGuide.